An opinion on...: The first comprehensive review of 22 online athletic event registration services. The Good, the Bad, and the Ugly. 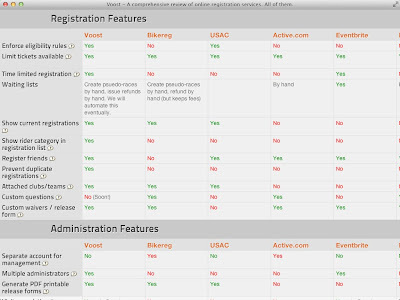 The first comprehensive review of 22 online athletic event registration services. The Good, the Bad, and the Ugly. Over a hundred hours of tedious research, creating accounts, combing through documentation and FAQs, setting up test events, going through registration processes, calculating fees, etc. While we certainly have biases, we have tried to present the information as objectively as possible - this isn't a cheap marketing gimmick designed to show green checkboxes for us and red Xes for our competitors. We freely admit that there are features other services have that Voost does not (yet!) - and this information is reflected on the table. The table is not complete. We have left fields blank where we just couldn't figure out the answers (and believe me, we tried). Despite our best efforts, there may also be errors - again, some websites seem to deliberately befuddle attempts at objective comparison. Click the image to view the whole table.